Questioning Answers: Can a bone marrow transplant really affect psychotic symptoms in schizophrenia? Can a bone marrow transplant really affect psychotic symptoms in schizophrenia? "Though BMT [bone marrow transplantation] may not be a cure for all cases of schizophrenia, it definitely possesses the potential to manage overall disease severity and improve the quality of life, and this case report is a preliminary demonstration of the safety and efficacy of BMT in treatment-resistant schizophrenia." So said the findings reported by Tsuyoshi Miyaoka and colleagues  (open-access available here) discussing a case report of a young man initially diagnosed with paranoid schizophrenia which was eventually deemed 'treatment-resistant' on the basis of his lack of [positive] response to anti-psychotic medication(s) given for "his auditory hallucinations, suspiciousness, active social avoidance, persecutory delusion, and deterioration in the level of social functioning." Things unfortunately got worse for this young man we are told, as he was subsequently diagnosed with acute myeloid leukemia - cancer of the white blood cells - setting in motion the initially daunting task of treatment via a bone marrow transplant. As the name suggests, BMT involves the transplantation of bone marrow where stem cells are made. Stem cells are those wonderful cells that give rise to the various types of blood cells we all have among other things. The idea being that a kinda of reboot of white blood cells in this case could potentially treat his leukemia. Although Miyaoka et al don't actually say how successful the BMT was for his leukemia (the patient was alive 8 years after BMT so I assume successful), they do talk about what happened to his psychotic symptoms following the BMT. So: "Thirty days later, his psychotic symptom had almost disappeared. He was sustained without any neuroleptic treatment and need for any other administration." 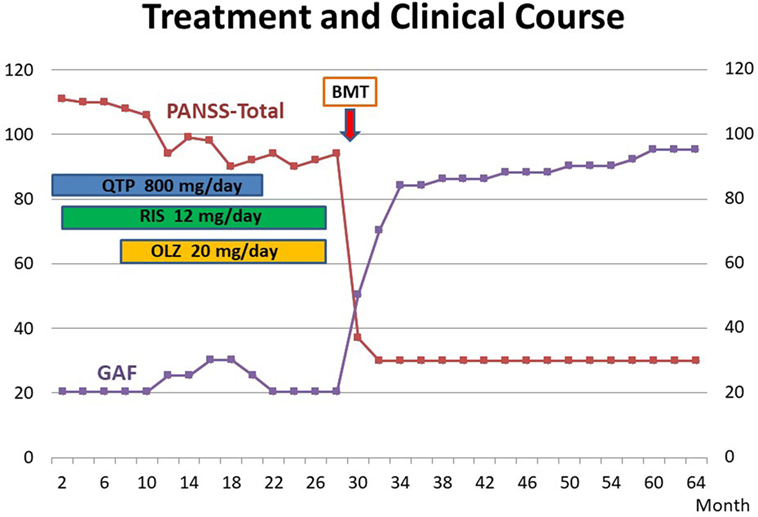 Indeed, this didn't appear to be any short-term effect neither as "8 years after BMT, the improvements of somatic and psychiatric symptoms are continued, and the patient is very well and there are no residual psychiatric symptoms." In short, things were still going well for this young man both in terms of his past leukemia diagnosis and also psychotic symptoms. There is always the possibility of "spontaneous improvement without any treatment" as accounting for the psychiatric results presented by the authors. Indeed, I also note that various immunosuppressive medicines were also administered around the time of the BMT to "avoid graft versus host disease (GVHD)" which might also have played some role in light of other research suggestions . One has to be careful not to jump to too many conclusions particularly on the basis of single case reports. But... it is a potentially important coincidence that use of a BMT came at the same time as the symptom changes noted. I'll also draw your attention to a 'call for case histories' on the topic of "BMT in patients with coincident schizophrenia" made by Sommer and van Bekkum  on the back of other work from these authors in relation to "the possibility that schizophrenia may be transmitted" where "a patient... developed severe psychosis after receiving a BM transplant from his schizophrenic brother" . It seems that there may be a two-way process potentially at work when it comes to immune function and schizophrenia. This is interesting stuff. Framed alongside the idea that schizophrenia might not be a homogeneous condition - think 'the schizophrenias' - and that at least one 'type' of schizophrenia might have a significant 'immune' component to it (see here for example), one could envisage further investigations on the potential use of BMT in certain cases. I do have to mention safety and the possible side-effects of BMT outside of just GVHD (see here) as being important considerations; added to the invasiveness of BMT. Miyaoka T. et al. Remission of Psychosis in Treatment-Resistant Schizophrenia following Bone Marrow Transplantation: A Case Report. Front Psychiatry. 2017 Sep 21;8:174. Knight JG. et al. Rationale for a trial of immunosuppressive therapy in acute schizophrenia. Mol Psychiatry. 2007 May;12(5):424-31. Sommer IE, van Bekkum DW. Call for case histories of BMT in patients with coincident schizophrenia. Bone Marrow Transplantation. 2013;48(6):880. Sommer IE. et al. Severe chronic psychosis after allogeneic SCT from a schizophrenic sibling. Bone Marrow Transplantation. 2015;50(1):153-154.